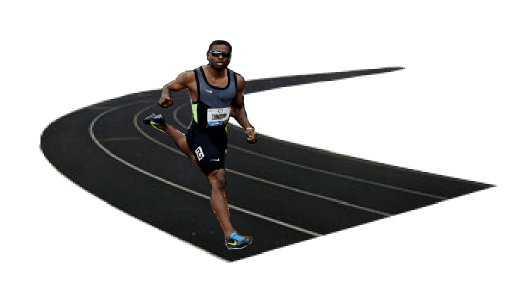 A recent comparison of Carl Lewis v Usain Bolt by Michael Johnson – and the ensuing online discussion – has prompted this post. In part because I disagree with Michael, and in part by the direction of the online discussions themselves. I’ll start by saying that for me, the conversation is about a comparison of the two athletes, NOT a discussion of which is the GOAT. Because for me one does not belong in THAT conversation, and I will explain why before I close. First, let’s address comparisons in general. Personally I do think those discussions are good for the sport, and frankly we should have more of them. Why? Because it exposes newer/younger fans tip the history of the sport. Many young fans only know of Usain – and Gatlin, Powell, Gay, Blake et al. To invoke a conversation that includes Lewis also opens the conversation to Burrell, Smith, Deloach, Marsh, Mitchell, Bailey, Christie, and of course B. Johnson AND MJ!! There’s history there that needs to be taught. The sport didn’t start with Bolt and it won’t end with Bolt – in spite of words from Coe to the contrary. Frankly the history of the sport, especially the sprints, teaches us what’s REALLY important in track and field – COMPETITION. Which takes me to the current comparison. Love him our hate him – and there are those on both sides – Lewis was a prodigy that made an IMMEDIATE impact on the sport! And he did so on the track AND in the field. On the track Carl was flirting with sub 10 at a time when only two athletes had legally broken the barrier – Jim Hines (9.95) and Silvio Leonard (9.98). And Leonard’s mark was done at altitude. THAT is huge in this debate – but a fact few know. When Carl ran 9.97 in Modesto (originally announced as 9.96)" he was basically in WR territory. And stayed three until the later stages of his career. The same in the 200. His 19.80 win in Los Angeles as only behind Mennea’s altitude WR of 19.72! His 19.75 in Indianapolis with hands in the air was even better and would’ve been a record of not for the exuberant celebration. On the field, he was just as dynamic. Carl made jumping 28 feet common place at a time when, 29 feet was an aberration and 27 feet was a struggle for most others. Beamon set an awesome record in the long jump, but Lewis took the event to the next level! Much like Edwin Moses (who should be included in a discussion of GOAT)! Carl Lewis STILL dominates the realm of 28 foot jumps. Had a barely, barely foul of somewhere in the neighborhood of 30 feet. And jumped 29 feet in the greatest long jump competition of all time – Tokyo ’91. Add to that his legendary battles with Larry Myricks including San Jose ’87, and Indianapolis ’88 to go with Tokyo, and you have one of the sport’s ultimate competitors. And THAT is actually where the separation begins in this conversation. Lewis competed in three differing events, the 100, 200, and long jump. He did so against what were the best athletes in history at the time, Burrell, Myricks, Smith, Powell, Johnson and Johnson, and over 90% of the time emerged victorious! And let me take a moment to say that MJ and Carl were BITTER rivals and I would not expect MJ to be an objective commentator on any discussion regarding Carl – some history that the youth need to know! Carl is only the second individual to win four gold medals in a single games – replicating the great Jesse Owens.. And is one of only two individuals to win gold in four Olympics in the same event – Carl, long jump, Al, discus! Carl made the ill-fated 1980 Olympic team as a college freshman. Made the first World Championships in 1983 winning three gold medals (100, LJ, 4×1). And made teams and won medals thru Atlanta ’96 where he won gold in the long jump in his final appearance! One final thing before I move on to Bolt. Carl was involved in what may still be, the greatest rivalry ever seen in the sport – Carl v Ben Johnson! Quick synopsis. Carl dominated the ’84 Games, with his four gold’s performance. Trading bronze in the 100 was Ben. Ben improved in ’85/’86, getting down to 10.00 and ranking #1 in the world in’86 – both he and Carl were undefeated but never went head to head! The second ever World Championships were in ’87 and the race EVERYONE was waiting for was Ben v Carl. Gun up. Bang. Ben off like a bullet. Ben smashes WR in 9.83, Carl second in 9.93 trying the old record! We wait a year for the rematch. In between, Ben has injury. Carl runs windy 9.78 at Trials, then defeats Ben in Zurich in 9.97 two weeks before Seoul. Both look good in the rounds in Seoul with Carl looking perhaps a tad sharper. Then the final. Gun up. Ben out like The Flash! Running thru the line with his arm held high Ben 9.79, Carl 9.92, Christie 9.97, Smith 9.99 – the first race ever with four men under 10.00! For three days Ben is the King of Track and Field. Then the headlines. Ben Busted. Steroids. Ben leaves town. Carl gets gold. And discussions that dominated the early days of the Internet. Your elders will revisit this in their memories I’m sure! So, what about Bolt? First, I’ve given a lot of detail on Carl because most of you know little to nothing about his career. So if you’re going to compare, you need to know what you’re talking about. Because as I alluded to in the beginning, some of you believe sprinting started with Bolt. Well, it didn’t. Nor did Bolt’s career begin in Beijing. Like Carl, Bolt was a prodigy winning regularly in the Jr. ranks. But unlike Carl, Bolt didn’t dominate right away. After setting a WJR in the 200 (19.93), Bolt went to Athens (’04) and couldn’t get out of the rounds. He went to Helsinki (’05) and made the final, placing last. He then went to Osaka (’07) taking silver behind Tyson Gay. Bolt’s career took off in ’08 however, in large part because he added the 100 to his racing itinerary.. First a WR 9.72 against Gay in New York. Then in Beijing (minus Gay who was injured at Trials, really the end of his career) a 9.69 WR victory, followed with 19.30 to win the 200. Then in ’09 his 9.58 WR win over Gay (9.71), with 19.19 for the deuce. He false started out of the 100 in 2011 (rule change got him) but he wins the 200 19.40. Then he wins London (9.63, 19.32). Then he won doubles in ’13/’15’16 (9.77/19.66, 9.79/19.55, 9.81/19.78). And then as we all know the wheels came off this year. So much for the highlights of both men’s careers. The final thing in going to mention, because it’s critical in this discussion for me, is their careers outside of Championships. Carl competed often from 1980 until 1992. After his debacle at the ’92 Trials, Carl became scarce in the sprints, though he continued to long jump. He was always dominate in the long jump for some sixteen years. In the sprints he was the man from approximately 83 thru 91 – eight years. Ben being his only true blemish. He tending near the top thru ’93, even winning bronze in Stuttgart to go work Long jump gold. And his only major loss in the long jump being silver in 91 (at 29 ft.) – though he went home with 100 gold and a WR 9.86! And Bolt? No wins from 04 thru 07 – in or out of Majors. He did compete with some regularity on the circuit between ’07 to ’11. Begging fairly dominant surfing that four year stretch. Though he did have losses to Powell, Gay, and Blake. Then only a handful of races outside of Championships from ’12 to present – final 5 years of his career. So, there is the information that I feel is relevant in making this comparison. And with that, my analysis. When it comes to races in the spotlight (Championships) Bolt has had an eight year stretch (’08 – ’16) second to none. It wasn’t that great in the beginning (’04 – ’07) and we saw what happened this year. He was a showman to the end, his charisma clearly on display this year in London. And it this, his charisma, his eight year championship run, and the records he set eight years ago, that most remember when they talk about his career. These things, in my humble opinion, make him they greatest championship sprinter of all time. But does NOT put him ahead of Carl in the comparison, nor the GOAT – that’s another discussion entirely! This segment of Bolt’s career aside, there is the period before this "window" with many, many losses and no dominance, that puts him behind some other elites, including Carl in this conversation. Clearly the list of athletes ahead of him in any discussion is small. Bolt’s accomplishments far outshine all but the elite of the elite – but Carl IS one such athlete. That said, Carl was a dominant force for over a decade and a half. He won gold in the long jump in Four Olympics, sixteen years of dominance. Four gold’s in a single Games. At or near WR level in the 100 from ’80 thru ’91 – eleven years! Take note at how much Bolt has fallen off after the first three years! Medaled in the 200 thirteen years apart! And while Carl didn’t set the long jump record or 200 record, his 200 was intrinsically meter than the altitude set record, and his long jump body of work is still the best ever and he did jump 29 feet. Then there’s longevity – no comparison. Yes, Bolt IS the best championship sprinter in history. But there is NO comparison in overall body of work. Carl, hands down had the better career. And for the record, anyone that knows me will tell you I was rooting for Ben. Like many at the time, I found Carl both arrogant and eccentric. That said, his athletic performances were undeniable. And THAT is what any comparison should be about. Alright. Y’all can start taking your shots at me now. Wait till I do a GOAT of the sport and greatest all time sprinters posts.